I so appreciate all I learn on this forum and finally have a couple of images to share for your critique. These are 2 of my favorites from this year. They were "unplanned" as i was chasing light and happened to be in the area. I had just enough time to get my tripod but not enough to use the cable release. Re: Critique #1 - late day light! mm: Thanks for jumping in the pond . Before I say anything specific, let me pontificate about some general elements of photography (maybe even art, though without a camera, any attempt at art by me would be hopeless). First, "rules" (or I prefer "guidelines," because they don't seem so carved in stone) are made to be broken. Second, having said that, it is important to have a firm grasp of the guidelines before you do break them - and when you break them, you can then do so purposely (or at least knowingly). One really important guideline, in my view is to make sure your horizon is level (which, I believe you have done very well in both images). I am astounded at how many facebook images of sunsets I see where there is a lake in front of it - which should be physically impossible, because looking at the horizon, the lake tips so far to the left or right that it should drain! Another firm guideline in my mind is the "placement" of the horizon. Most of the time, placing a horizon dead center is something to be avoided. Middle of the image placement is static and "boring," One particular time this rule is often broken is in reflection images. You have to think about what in the image is the "horizon" and where you place it specifically every time you compose an image. If you don't, I believe our eye/mind has a tendency to place it centered. Likewise (note that I mentioned this in the photo posted by Janice), placement of the subject (or central elements) in the center of the image is also something to be avoided (something I call the "bullseye" effect). It is again often static and can make an image look like a "snapshot." In my experience, "portraiture" (including human and wildlife subjects) can and often does, successfully avoid this guideline. But landscape images, in my view, demand careful attention to placement of elements within the frame. Many cameras have a feature in the viewfinder or the frame usually referred to as grid lines. I set mine to divide the frame into thirds (which most of my cameras have not successfully really done - but close enough). There are 4 points where these grid lines intersect that I use as guidelines for placement of elements. Most images have a clear subject. Good composition thinks about how to best put the subject at the center of the viewers attention. There are many ways to do that. Sometimes we do it with focus. Sometimes the good lord does it for us with lighting or other elements (though it is still our stewardship obligation to correctly use and place these things - don't ya like how I got my Sunday Sermon in there, too ). In doing this, we want to try to avoid wide expanses of things that have no photographic or compositional interest (though this may be the guideline I break the most often). Using things like foreground and background elements, and leading lines, gives the image 3-D Texture. I think Al has the best explanation and approach to this when he explains how he likes to see a foreground, a middle ground and a background with clear and well thought out elements (easier for us to say than to demonstrate). For the reasons above, I like what you have done with the composition of the second image better than the first. The ditch in the foreground gives some interest and adds a leading line into the image. The placement of those beautiful white marshmellows (UGH! 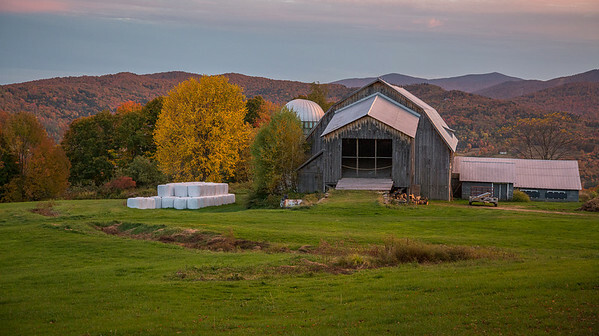 I absolutely hate what white vinyl has done to the Vermont landscape - but I "get" why the farmers do it), at a diagonal continues the lead in to the barn, which is, in my view the subject. You have Al's three zones, the foreground, the barn and the mountains receding off in the distance. Horizontally, you have placed the barn away from the direct middle, and the large golden Maple to its left gives the image "balance." I also note another thing going on here: Balance in composition often depends upon "weight." The barn is very large and the tree is smaller. But the bright color of the large tree and the red tree further to the left give--because of their relative brightness and "eye-interest" equal weight. HOWEVER (damn lawyers, always using that word), I look at this image and ask: where is the horizon. Some would say its the sky above the mountains. I would still look at the point where the eye expects things to begin to recede off into the distance as the "horizon" of the image. To me that is the point somewhere behind the barn where the farm field "stops" and the tree line begins. And that is still almost dead center. Some are going see that is perfectly fine. I am not saying it is "wrong." And sometimes you just cannot help where it is if there are other important elements which must be included in the image. In this image, I think you could still crop more of the foreground, which would have the effect of moving that line down into the bottom third of the image, without losing any of the leading elements' impact on the foreground. Is there anything missing in this image? It stands on its own as a nice image, but the dramatic sky in the first image is where its all happening in my view! So, lets look at the first image. First of all: The SKY!!!! There an old film photographer's saying: "F8 and be there." Al says: "You have to get to work on time." In other words, you caught it because you were there at the right time (not really totally unplanned. You knew it was the right time of day, so you went and hoped Mother Nature would be cooperative - and clearly she was). Great capture. HOWEVER ( ), this is where those pontifical guidelines above come in. 1/2 of this image is the green grass in the foreground. There are some nice leaves on the left, but not strong enough in my view, to create a dramatic foreground. And the green expanse in front of the barn detracts from the "real" image here, in my view. It makes the composition static and there is simply too much "uninteresting" green expanse. If you crop that green expanse somewhere just below the ditch in the foreground (to your taste), I think it totally transforms this image. The subject, here, is still barn -- right? 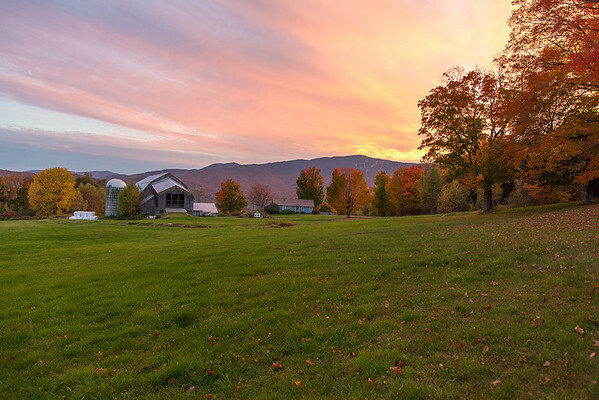 The sky is just a magically delicious element that sets the barn in that little slice of heaven that is Vermont landscape. We still keep the leaves on the ground at the right foreground. We also move the horizon way into the bottom 1/3 of the image, and give that magnificent sky some breathing room. Horizontally, I think you've done a great job of balancing the elements again. Again, there is enough "weight" in the bright maple and the barn and buildings, to offset the larger trees on the right. When you make my suggested crop, do you see that the image takes on an almost panoramic look? Brings up another point. It is one that I struggle with a lot. Our cameras give us a certain shape "box" to work with. I don't think outside the box well. But that is exactly what I am suggesting here. This will not result in an aspect ratio that is "normal" for your camera. And it may not fit - if printed - into a "standard" mat/frame dimension. But that is boxing us in. More and more, I am cropping to "look" rather than trying to stay inside my 35mm "box." James Moore, who is a pro that I have learned a huge amount from over the past 2 years, points out that we are working with digital tools and there is no reason we cannot take our images in separate "parts" and then blend them together when we get home (kind of like the way a panoramic is done, but his point is that it doesn't have to be limited to one direction). I need to start working that thought process more into my own shooting habits. In both of these images, there are some post-processing things that could be done to make the image stand out a bit, but I think these are just such great examples of composition, that that is where I concentrated my remarks. My comments are my opinion, only. They are not "right" and they are not "wrong." That's what makes each of us the artist. I appreciate the opportunity to look at, review, and even critique the work of others. Having to think about these things and articulate them is as much a learning experience for the critiqer as for the critiquee. Thanks for these MM. Hope you'll keep doing this. I have not had a lot of time for my own processing lately, but in the coming weeks, I'll try to toss out a few more of my own images. thanks so much for ALL of your comments and critique! I agree about the first image and am including a "cropped" version of the image here. I still have LOTS to learn about post processing/editing. I have/use Lightroom but know that I only use a small portion of what LR is capable of doing. Someday i might have more time to learn more about the process but my limited time has kept me from more seriously pursuing this! I am comfortable "playing" with LR but one day will do so while also understand what I am doing and why! In terms of the horizon, I also appreciate that reminder. This particular location does pose some challenges given the way the barn is situated! Soooo, here is a cropped version of the same photo! I was going to make some of the same comments that Andy did but he beat me to it and I see that you have already applied them with your crop. That said, I'll approach the same concepts in another way. Andy is so right about the foreground. It appears to me that about 50% of your first image is green grass. "Fill the frame with your subject" is a good piece of photographic advice. If we assume you applied that rule to photo #1, we would think that the grass is the subject since you devoted so much space to it. You've now cropped the photo to eliminate much of the grass and the shot looks much better. Of course your photo now looks more like a panorama. Nothing wrong with that but you've cut out about half of the original pixels. I know you didn't have much time but it looks like you have plenty of space to the left of the barn and you could crop a bit from the right. That means you could have moved closer without losing any critical part of the shot. Alternatively, you could have used a longer focal length. That is not necessarily better than moving closer but it would have helped. Again, time flies, but if you were closer to the trees, you might want to consider using a flash. You would be surprised at the impact of a little foreground light on a back lit feature. You have to be close enough and have a strong enough flash, but consider it in the future. Since the sky is what makes the photo you could have raised your camera to include more of it. Look at your cropped image. Just think if you would have added as much additional sky and as grass you cropped. (I hope that make sense.) Since the sky is the subject of the photo, fill the frame with it. Furthermore, if you had raised the camera you would have included the entire tree top on the right rather than cutting it off. What's more, the barn and trees would have filled the bottom third very nicely. I am really big on including interesting foregrounds. Here's why. A photo attempts to show a three dimensional scene using two dimensional media. There are a number of ways to create the appearance of three dimensions. One of the easiest is to include some good foreground. Had you moved closer, the trees on the right could have better filled the foreground space, the barn and trees the middle ground and the mountain the background. For me, anyway, the cropped photo has middle and background. I realize that in pastureland, it may be difficult to find interesting foreground but your other shot includes the ditch. Had you moved closer, the ditch and or the trees on the right could have provided the foreground. (Notice the foreground on Janice's image. the bushes have nice big leaves which creates the appearance of being close and therefore makes a very good foreground element. One last comment: On your latest version, the yellow in the sky is too saturated. I have Lightroom but don't use it so I can't really help you with that but I'm sure you can saturate individual colors. I'd tone down the yellows and maybe increase the reds. I revised your original image by cropping it in the same way you could have if you used a longer focal length but I kept the same aspect ratio as the original photo. I also saturated the colors in the trees on the right and cooled down the grassy area. If only you had included more sky! Interesting how we can each "see" things differently. I think Al's comments about "cropping" in the viewfinder (i.e., composing for the "final" image by moving around and using different focal lengths) is good advice. I think the "moving" part is even better advice. I have found myself getting lazy over the years because of the availability of zoom lenses. In some case, they are a godsend, because you physically cannot move. In others, they become a hindrance to creativity. I have been shooting more with prime lenses lately and have found them to be "freeing." I think your crop works fine, compositionally as a panoramic image. It does give it more of a "wide-angle_lense" appearance. Note how the barn and other elements seem much smaller and more distant. But that is natural, in my view, for a pano. I also like Al's advice to us to fill up the frame with our subject. I wrote a blog post in the early days of my blog titled, "Get Closer." My own approach is to try to capture a more "intimate" view of the subject. But sometimes it is a challenge to determine which of the elements in a more busy composition should be placed where, and that presents conflicting thoughts. In this case it would be natural for some to view the barn as "the" subject. And you would not have made this photograph without the barn in it. But in this case, the sky comes to the front and center and the barn becomes a (albeit very important) "prop." However, in my own case, particularly as I shoot more in the "travel" genre, I have begun to realize that in getting that up-close, intimate view, I sometimes miss the opportunity to capture "context." In the "panoramic" version of this shot, I think you have done the "context" part well and still gotten the primary show - the sky - presented nicely. 1. While I generally agree with Al's philosophy about the 3-dimensional aspects of a photograph, I don't think you have to follow that guideline as a hard and fast rule on every image. Had his crop been the first version I had seen in the image, I would probably not have made the comments about the foreground and horizon, as he places them very traditionally and the front to back "balance" in the image is very good. However, side-by-side, compostionally, I prefer your panoramic version. This is primarily because of the horizontal "balance" which I spoke of earlier. I like the placement of the barn and tree in the image much better than in Al's version. The barn in his version feels "cramped" against the left frame to me, and I think the inclusion of the nicely "foliated" (is that a word, CT? ), tree on the left is an important element to the compostion. 2. The second is that with this often photographed subject (I have several in my own portfolio) is a challenge not to produce a ho-hum, "been there, done that," image. I think this one accomplishes that and sometimes you have to deviate from "rules" in order to make a unique image. Oh, and by the way, (I don't think anybody ever thought they would hear this coming from me ), on my monitor BOTH mmvt's pano and Al's version have parts that I think are over saturated! The pano looks over saturated to me in both the reds and yellows. I think the original posted version has better color. I think the reds are over saturated (on my monitor, atl least) in Al's version too. Topic - Critique #1 - late day light!